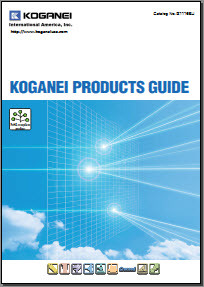 Koganei Corporation is a leading company to serve your factory automation and labor saving requirements with our pneumatic and electronic product range. Productiviy improvements and cost efficiencies are company' s pursuing targets, and they are vital for your competencies. By using pneumatics features which are cleanliness, low cost, and functionality enabling delicate human finger-like movement, we provide solutions required in a wide range of industries. We have also been developing environmentally friendly products used in water purification equipment etc. Square type solenoid valves covering from small to large sizes with a wide range of functions. These are Koganei standard air valves. Square type solenoid valves with a wide selection of sizes and functions, featuring space-saving and low power consumption, and also applicable to various companies' serial transmission systems. Square type solenoid valves usable from 0 MPa operating pressure. There are some models used as divider valves or selector valves. Suitable for high-speed positioning of lightweight workpieces, pressing/pushing applications, setups of which have to be modified frequently and processes requiring high-frequency/long-life. Control method. Open loop control. Teaching Box of iB-Move is handheld and lightweight, and its display is easy to see. Main unit of Digital Flow Controller iB-Flow. Easy setting for actuation time of a cylinder, safety structure not to loosen the needle, synchronous actuation of several cylinders and excellent in precise flow control of an air blow. Constantly monitors and corrects cylinder takt time automatically. iB-Cyclone uses a high-speed cyclonic system to maintain water separation rates even if flow is increased. Separation performance is always steady small to large flow rates. To properly ground high speed processes or control the relative humidity, the Fan Type Ionizers were designed to maximize your production while reducing operational costs. The DTY-ELF14HC includes an auto needle clean function. All models provide long term maintenance free technology. Find all of Koganei's videos on their YouTube Channel. Valve Application? Contact Us to Get Started!